Three months since the last community clean up but I had excuses: cataract op, South African visitor, visiting MIL in Scotland. At least I have broken my duck early for 2013 so let's see how many I can make this year. A bit chilly but I had taken the precaution of wearing my walking long johns and extra thick socks. This month it was a revisit to the Kimber Road stretch - previous visits here include January 2012 and August 2009 plus, quite possibly, others I have missed. 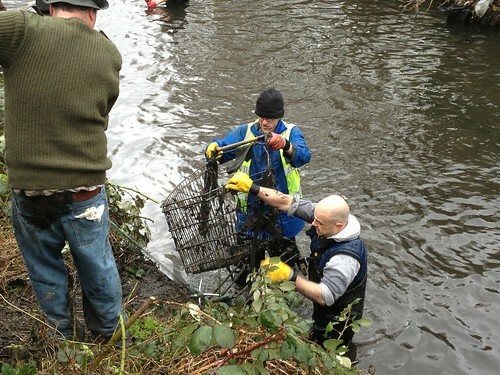 Despite previous clean ups there was still plenty of junk to be hauled out of the river. As before in this stretch there was a reasonable haul of shopping trolleys. Hauling a shopping trolley out of the river. The river was flowing fast and deep in places and it was getting chillier and chillier. I not not unhappy when they called an early finish at 3:30. There were plenty of volunteers helping load the rubbish onto the lorry so I left them to it and went home for a soak in the bath to warm up. 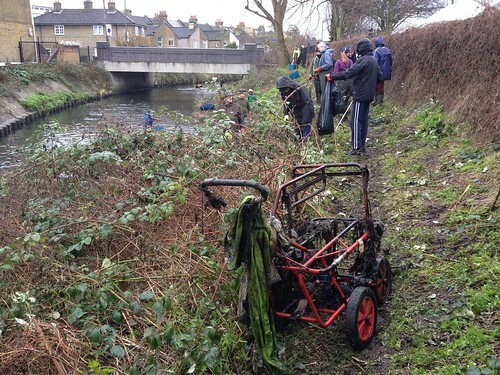 More about The Wandle Trust.